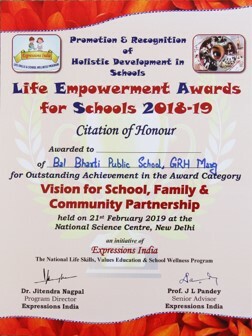 In the Life Empowerment Awards Ceremony 2018-19 organised by Expressions India at National Science Centre, New Delhi on 21 February 2019, the school was felicitated with noteworthy honours in all the four categories for which the nominations had been filed. In India’s School Merit Awards, the school has been Ranked No.1 in India under the top CBSE School Parameter for ‘Individual Attention to Students’ in the survey conducted by EducationToday.co. 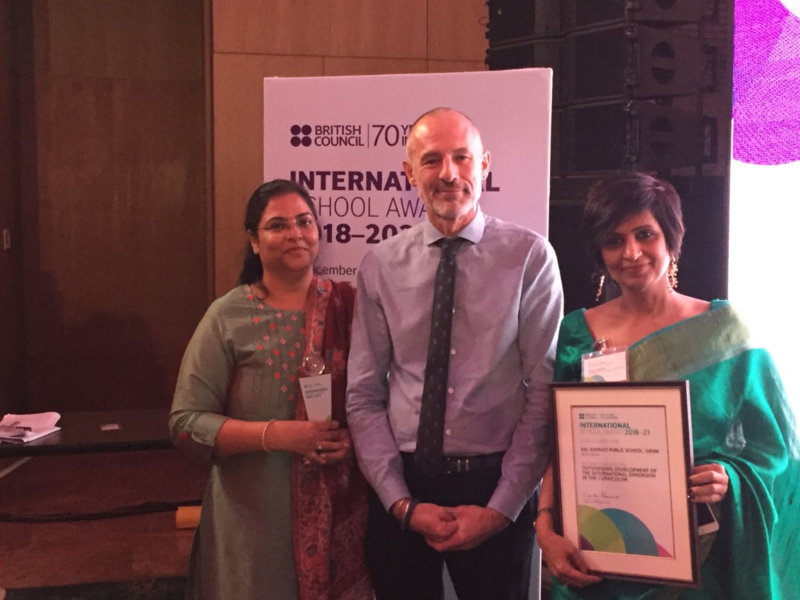 ISA Coordinators Ms. Pooja Ahuja and Ms. Rachna Chaudhary represented our School and received the International School Award 2018-21 , bestowed upon the school for the fourth consecutive time, from Mr. Duncan Wilson, Director Schools, English and Skills, British Council , in the Annual Award Ceremony held on Wednesday, 5 December 2018 at The Leela Ambience Convention Hotel, New Delhi. The ceremony was organised by the British Council to accredit 176 Schools located across Northern India for the notable global element in their curriculum. Certificate on behalf of the school. 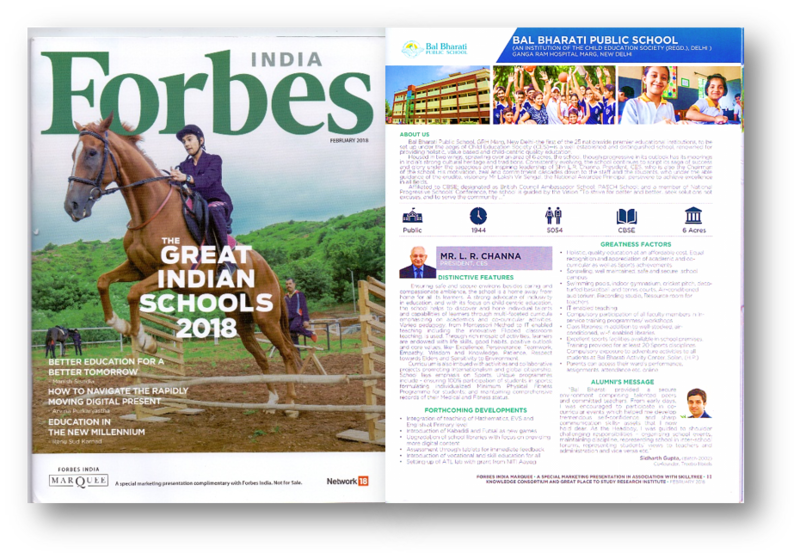 The school was among the 35 schools selected from all over India to feature in the 4th edition of Forbes India (Marquee) Publication titled - ‘The Great Indian Schools’. The special edition, released along with the Forbes main edition in February 2018, focused on schools that have set a benchmark for quality education with core focus on Happiness Index and Student Satisfaction Survey. The school has been awarded the Special Jury Award under the FICCI Road Safety Awards 2017 for the project - 'Safer Roads, Safer India : Classrooms with a cause' at an impressive ceremony held at FICCI, Federation House, Tansen Marg, New Delhi. The project revolved around sensitizing students about the importance of Road Safety & making them aware about Road Audits. Several awareness campaigns were also organised to sensitize the school bus drivers and staff members. The students also prepared a Street Play which they performed at Connaught Place on 27 November 2017 at Rahagiri Day. Excellent performance of students in District Level Cultural Competitions have qualified the school to participate in the following State Level Competitions: Mono Acting, English Extempore, Instrumental Music, Solo Song, English Declamation, Hindi Declamation, Sanskrit Kavayali, Hindi Poem Recitation, One Act Play. The school has excelled in sports yet again. The brilliant performance of students has led the school teams to qualify and participate in the CBSE National Championship Competitions for Swimming; Basketball; Judo; Rope Skipping and Chess. Confederation of India Universities bestowed an International felicitation, Skill Centric School Education Award 2017 upon the school, Principal Mr L V Sehgal and five teachers, namely, Ms. Vinita Dhawan, Ms Neenu Singh, Ms Anjali Kaushik, Ms Ruchi Gupta and Ms Sandhya Makkar on 03 October 2017, on the occasion of the National Skill Development Summit at Indian International Centre, ND. World School Excellence Award 2017 was presented to the selected schools of Delhi NCR by Confederation of India Universities on 6 September, 2017. The Principal Mr L. V. Sehgal and three teachers, Ms Meena Malhotra, Ms Sunita Gehani and Ms Poonam Sondhi have been conferred the prestigious award on the occasion of World Education Convention 2017. In the league table of India’s Best Co-ed Day Schools in the Education World India School Rankings 2017, the school was ranked 65th at the All India level as against 69th last year. In the State Rankings, the school was 39th; and at 28th position in the City Rankings. The assessment was based on a questionnaire administered to a carefully selected sample base of parents, principals, teachers and educationists across 14 parameters of educational excellence, such as competence of faculty, academic reputation, co-curricular education, life skills education & conflict management etc. In the Times School Survey 2017, the school was at number 3 in the Leaders category in the Central Zone, rendering the school as the topmost, within 7 kms radius. The study consisted of, firstly, the Factual Survey, in which a structured questionnaire was administered to the respondent school. This was followed by the Perceptual Rating Survey wherein the feedback was taken from school teachers, alumni, experienced parents, students as well as aspiring parents. The Principal, Mr L V Sehgal was felicitated with the Women Empowerment Award for his indispensable contribution in educating the girl child and empowering women through employment, in the World Girl Child Education and Empowerment Summit organised by Women’s Agency for Generating Empowerment (WAGE) on 8 March 2017. The school was awarded a Certificate of Excellence by National Productivity Council in collaboration with Ministry of Urban Development in appreciation of the project -Trash to Cash, undertaken by the school as a part of promoting 3Rs (Reduce, Reuse and Recycle) during 2016-17. The Felicitation Ceremony was held on 13 February 2017 at National Productivity Council Center, Lodhi Road, ND. In Educomp NDTV Awards, in the Category of Principals, I was selected as one among the top six nominees in the entire Northern Region for an Award in each of the two categories, Excellence in Inclusive Education and Excellence in Instructional Leadership. Here, I’d like to add, that besides me there were only two other Principals who were selected as Nominee-Principals in both the categories. Ms Nidhi Bajaj (TGT Maths) was selected as the Nominee-teacher in the category of Excellence in Maths Teaching in the entire Northern Region. Sarthak Gupta (VIII E) is among the five national winners of Google Web Rangers 2016 Competition for his excellence in promotion cyber safety through the Poster submitted online in December 2016. Altogether, 500 schools participated in this online competition which aimed towards creating a safer computer and internet society. In the Felicitation Ceremony held at Le Meridien on 7 February 2017, he received a Certificate of Achievement and Samsung Tab. The school was also awarded a Certificate of Achievement. digitalLEARNING magazine felicitated the school for being ranked in the Top Schools of India in the 4th School Leadership Summit 2016 held on 21 January 2017 at Le Meridien, ND. In Central Delhi, the school has been accorded 3rd position in City Rank and 2nd position in the category of Online Presence. Action Committee, Unaided Recognised Private Schools felicitated the Head Mistress, Ms Sunita Gehani on being conferred the State Teachers’ Award 2016 in recognition of her outstanding achievements in the field of Education. The Award Ceremony was held at India International Center on 17 December 2016. In the World Cleanliness Convention 2016 organised by National Institute of Cleanliness Education and Research (NICER), on 12-13 December 2016, the school was bestowed ‘World Cleanliness Education Award’ for its outstanding contributions in areas related to cleanliness, hygiene and sanitation education. 2016 Global Human Rights Protection Award was conferred upon the Principal, Mr. L V Sehgal on the occasion of 17th World Human Rights Congress on 10 December 2016 by Indian Institute of Human Rights, ND. EducationToday ranked the school as No.1 in India under the Top CBSE Parameter for ‘Holistic Development’ in the India’s School Merit Awards, 2016. The school was selected amongst the top 150 Schools in ‘International, Boarding, CBSE, ICSE, State, Army, Boys & Girls’ category from all over India on the basis of ten parameters. The Principal, Mr L V Sehgal was felicitated with Leadership & Excellence in Education Award 2016 for his noteworthy contributions in the field of education by Knowledge 360, in the Award Ceremony held on 27 August 2016 at Hotel Radisson Blu, ND. The award was received by Ms Sunita Gehani, Headmistress on behalf of the Principal. Times School Survey 2016 accorded third position to the school, as against the fourth position last year, in the Leaders category in Central Zone. This ranking rendered the school as being the top most, within 7 kms radius. The study consisted of, firstly, the Factual Survey, in which a structured questionnaire was administered to the respondent school. This was followed by the Perceptual Rating Survey wherein the feedback was taken from school teachers, alumni, experienced parents, students as well as aspiring parents. In the league table of India’s Best Co-ed Day Schools in the Education World India School Rankings 2016, our school was ranked 69th at the All India level as against 71st last year. In the State Rankings, the school was 32nd;and at 25th position in the City Rankings. The assessment was based on a questionnaire administered to a carefully selected sample base of parents, principals, teachers and educationists across 14 parameters of educational excellence, such as competence of faculty, academic reputation, co-curricular education, life skills education & conflict management etc. In the league table of India’s Best Co-ed Day Schools in the Education World India School Rankings 2016, our school was ranked 69th at the All India level. In the state rankings the school was 32nd while in the City Rankings, the school secured the 25th position. 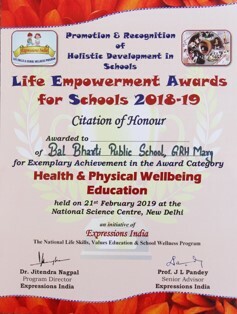 The assessment was based on a carefully selected sample base of parents, principals, teachers and educationists across 14 parameters of educational excellence, such as competence of faculty, academic reputation, co-curricular education, life skills education & conflict management etc. Ms Sunita Gehani, Head Mistress and Sanskrit teacher did the school proud when she was felicitated with the prestigious The State Teachers Award 2016 for her invaluable contributions in uplifting the standards of teaching in the academic session 2015-16. The award was conferred upon her by Ms Punya S Srivastava, Secretary (Education), Govt of NCT of Delhi, in the august presence of Deputy Chief Minister Mr Manish Sisodia; Mr Kapil Mishra, Minister for Tourism; and Mr KK Sharma, Chief Secretary, Govt. of NCT of Delhi and other eminent guests in the Ceremony held at Thyagraj Stadium, ND on the occasion of the Teachers’ Day, that is, 5 September 2016. Our Principal Mr. L V Sehgal was felicitated as the Winner of Educomp India Today Educational Excellence Awards in the category, ‘Consistent Pursuit of Academic Excellence’. The Award ceremony was held at TV Today Network Ltd, India Today Mediaplex, Film City, Noida on the 27 April 2016. The school was awarded the ‘Clean School of the Year Award’ by National Institute of Cleanliness Education and Research(NICER) on the occasion of World Youth Skills Day Celebrations 2016. Ms. Megha Arora, Asstt. Tr, received the award on behalf of the school in the Ceremony held on 15 July 2016 at India International Centre, New Delhi. The school was accorded 4th position amongst the best ten schools in the Leaders category in the Times School Survey 2015 for the Central zone. The study consisted of, firstly, the Factual Survey, in which a structured questionnaire was administered to the respondent school. This was followed by the Perceptual Rating Survey wherein the feedback was taken from school teachers, alumni, experienced parents, students as well as aspiring parents. EducationToday.co ranked the school as No.1 in the parameter of ‘Individual Attention to Students’ in the India’s School Merit Awards, 2015. The school was selected amongst the top 125 Schools in ‘International, CBSE & ICSE’ category from all over India on the basis of eight parameters, i.e., Academic Reputation, Individual Attention, Infrastructure Provision, Innovative Teaching, Safety & Hygiene, Sports Education, Value for Money and Co-curricular Activities. The Ranking was based on Jury Rating, Parents’ Votes & Perceptual Survey by the team of Education Today. The Award Ceremony was held on 12 December 2015 in Bengaluru to felicitate the winners. The School was accorded an eminently high position among the Best Schools of India, from the shortlisted 73 eduDestinations, in the digitalLEARNING School Ranking Survey 2015. The judgment was based on a set of five perception based parameters, namely, Goodwill, Legacy & Reputation; Academic Ecosystem & Outcomes; Future- ready Academic Infrastructure; Enrichment of Learning Experience; and Career Advancement. It is noteworthy that the school ranked highest in the category, Online Presence, in Central Delhi. The Principal Mr L V Sehgal was felicitated with Distinguished Educationist Award for his noteworthy immense contributions in the field of education by the Federation of Educational Publishers in India, an apex body of Educational Publishers. The award was bestowed upon him by Dr. Harsh Vardhan, Union Minister of Science & Technology and Earth Sciences in a ceremony organised on 11 January 2016 at India International Centre, ND. Ms Geeta Gangwani, Vice Principal and PGT Chemistry was felicitated with the prestigious ‘State Teachers’ Award-2015’ by the Hon’ble Chief Minister of Delhi, Sh. Arvind Kejriwal; and the eminent Deputy Chief Minister and Education Minister of Delhi, Sh. Manish Sisodia at an impressive Ceremony held at Tyagraj Sports Complex, ND on 7 September 2015. Sponsored by the Government of NCT of Delhi, the distinguished State Award is annually bestowed upon illustrious educationists to give public recognition for their meritorious achievements. The esteemed Award conferred upon the versatile Ms Gangwani is a befitting tribute to her notable contributions in the field of Education. Vice Principal, Ms. Geeta Gangwani was awarded the globally recognized GTA 2015 by Cambridge Foundation Education in collaboration with British Council Delhi. Under GTA 2015, Ms. Gangwani executed the action research project “How effective is the use of flex books and flipped classroom technique in enhancing engagement level and attainment score of grade XII Chemistry students”. On the basis of the evidence of execution and result of action research project, GTA was awarded to Ms. Geeta Gangwani in a ceremony held on 9 July 2015 at Hotel Kempinski Ambience.